Scandal Collar Body Restraint Luxurious collar with universal cuffs and adjustable restraints. Collar adjusts up to 20 inches. Waist straps adjust up to 46 inches. Reversible design to wear in front or back. Soft and plushy on one side, with designer fabric on the other. 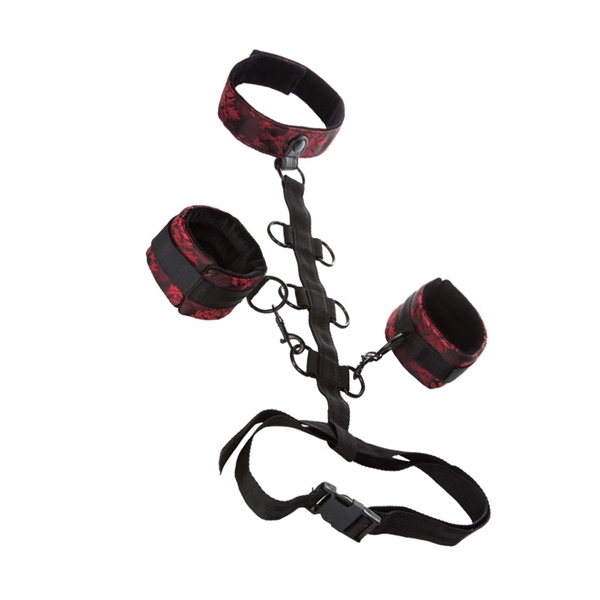 Detachable cuffs for independent use. Universal clasps and D-rings with swivel designNon-tarnishing, nickel free. Safe and pure for body and pleasure made using phthalate free materials: Polyester fabric, lining, Velcro, Polypropylene PP straps, buckles, Nickel free Alloy clasps, Nickel free iron D-rings. Bulk weight 8.1oz.